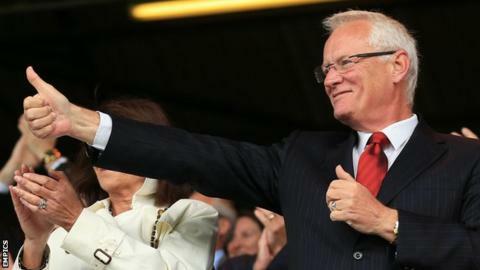 Former Leyton Orient chairman Barry Hearn says fans should back current owner Francesco Becchetti despite a poor start since his summer takeover. The O's reached the League One play-off final last season but are currently languishing in the relegation zone. "I think it is a learning curve they have got to go through and they have got to adjust their thinking as they go forward," Hearn told BBC London 94.9. "We should just wish them luck, watch and maintain our support for the club." He added: "There are disappointing results at the moment but there are signs that perhaps the worst is over." Hearn sold the east London club to Italian businessman Becchetti in July, having been Orient owner since midway through the 1994-95 season. Despite investment in the squad over the summer the O's have struggled and four different men have spent time in charge of the first team - a situation triggered when long-serving manager Russell Slade left for Cardiff City in September. Kevin Nugent and Mauro Milanese had short-term spells in the dugout before former Lazio and Fiorentina midfielder Fabio Liverani was appointed boss last week. "We all make mistakes in life and we all take time to learn what community football is all about," sports promoter Hearn, 66, added. "I made millions of mistakes when I started with Orient and I learnt from them. "The new owners have done what I thought they would do, which is put in a load of money. That is what football is more and more about these days and it is much more than I would have put in. "They are genuine people who have bought the club, but clearly they have got a lot to learn as well." "I did a 19-year sentence and I enjoyed it but once you escape from Colditz, you don't dig a tunnel to get back in." Hearn has also questioned the timing of the departure of Matt Porter, who stood down as chief executive following Becchetti's takeover but remained on the board of directors before resigning in October. "The Italian owners wanted to do it their way and I can understand that," he said. "My personal felling was it was a little early and they should have had a bit more settling in time with experience around. But that is their call as they are paying the bills and are in charge. "We won't agree with every single decision anyone makes but at the same time the club is the thing that lives for ever and the other people - myself included - are purely custodians." Hearn still owns Orient's Matchroom Stadium but has ruled out re-investing in the League One club. "I got cheered on Saturday when I walked in - it was great," he said. "I reminded them I am never coming back.